Use MAX Caution: the fun contained in these cans is super contagious. What party or prank could be complete without the awesome antics of spraying SILLY STRING, the party in a can. Our Green mighty MAX 24 Pack case of super-sized 5 ounce cans of Silly String is the easy to clean always enjoyable way to create MAX fantastic fun filled festivities and endless smiles. 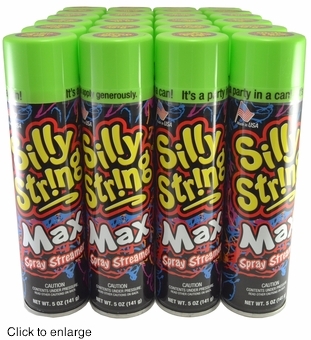 The super MAX 5 ounce cans have 65% more zany string spraying party time than the standard 3 ounce classic cans of Silly String. To even further ultimately optimize your string slinging excitement buy a pack or three of our awesome silly string blaster guns. Our original Silly String brand streamer is non-toxic, non-flammable and safe for children and the environment. Made in the U.S.A, Silly String has been delighting folks of all ages for 40 years. Be sure to read the directions on the can and never spray toward the face or eyes. Buy this MAX 24 Pack case or maybe even a couple Silly String MAX cases today. Then go get some serious silly to the MAX on! !